Union of Ukrainian Women (Союз українок; Soiuz ukrainok, or SU). 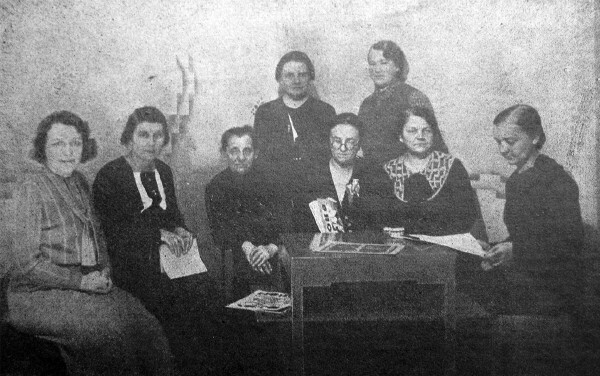 The largest Ukrainian women’s organization in Western Ukraine during the interwar period. 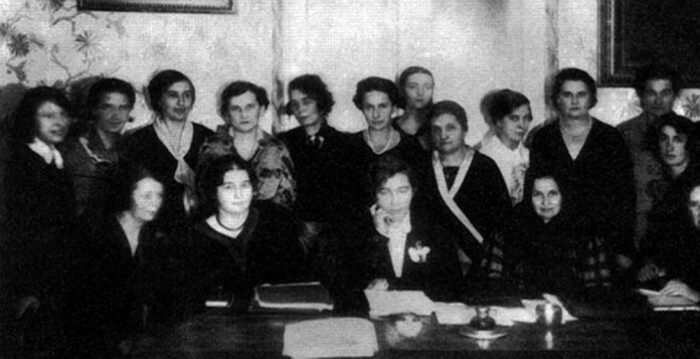 A successor to the Women's Hromada in Lviv, the group was established in December 1921 at a women’s conference in Lviv. It sought to improve the educational and economic status of Ukrainian women, and to involve them in civic affairs. It undertook activities related to community sanitation, social welfare, the co-operative movement, and the research and development of Ukrainian folk arts. The SU had a three-tiered structure, with a central executive in Lviv, branch organizations in larger cities and towns (67 in 1936), and village circles (1,101 in 1936). The Polish authorities deliberately limited the scope of its activities to Galicia. The SU branches represented approximately 30 percent of all Ukrainian settlements there, and its membership of 45,000 constituted about 5 percent of the female Ukrainian population. The SU was particularly successful in extending its influence into the countryside by dealing with issues of concern to rural women and by using its branches as regional organizational and programming centers for the village circles. The constitution of the SU was ratified in 1917 (wartime circumstances delayed its formal implementation until 1921) and amended in 1933. The work of the SU proceeded in several directions and at several levels. One of the earliest concerns was the adaptation of Ukrainian folk arts to urban uses; it was followed by the improvement of life among rural women as well as an involvement in the international women's movement. The organization’s work in the early 1920s focused largely on postwar reconstruction and the establishment of branches. In 1922 the Ukrainske Narodnie Mystetstvo co-operative was founded under the auspices of the SU as a means of popularizing and marketing Ukrainian folk-art items. To develop cadres to work in the field, training courses were organized in 1927, 1929, 1932, and 1937. Besides explaining the aims and methods of the SU the specialists lectured on topics such as the operating of co-operatives and nursery schools, housekeeping and garden tending, and the basics of hygiene. Course attendees (approximately 200 graduates) were mainly young women who had completed secondary education and were looking for employment. The most capable of these were posted in SU branches; others organized courses in the villages. In 1937 alone the SU sponsored 177 courses in various Galician villages, 81 on cooking, 13 on housekeeping, 52 on knitting and crocheting, 21 on pattern-making and sewing, and 7 on embroidery. The SU also added the organization of summer preschool education programs for children and the establishment of youth affiliates around village circles to its activities. The work of the central organization was divided into sections. The organizational section was headed by Olena Kysilevska, who contributed the SU circulars to the popular weekly Zhinocha dolia. The co-operative section was headed by I. Blazhkevych and, later, I. Hladka; it was responsible for disseminating information about co-operatives and keeping a close liaison with county unions of co-operatives. The health section was headed by Sofiia Parfanovych and, later, S. Korenets; it worked in co-operation with the Ukrainian Hygienic Society. The folk-art section was headed by Iryna Hurhula, and its activities were linked with those of the Ukrainske Narodnie Mystetstvo co-operative. The recruiting section was headed by Olha Tsipanovska, who was also responsible for Ukrainian studies, Ukrainian embroidery, and housekeeping programs. In the mid-1930s there were 142 girls’ groups organized around the village circles. 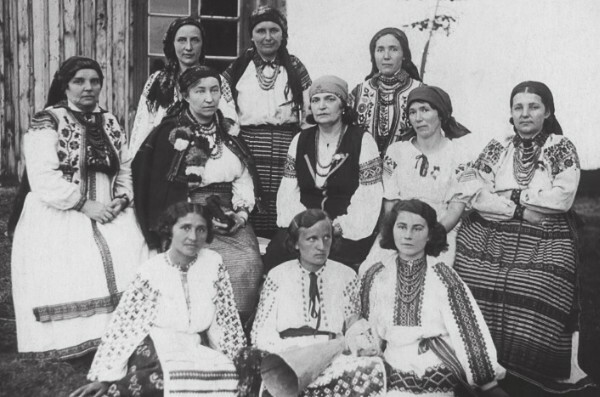 The growth of the SU was stimulated by the Ukrainian Women’s Congress, which it sponsored in June 1934 in Stanyslaviv, on the occasion of the 50th anniversary of the founding of the first Ukrainian women’s association. The gathering attracted not only a large portion of the SU membership but also representatives of many other women’s groups. The agenda of the congress included presentations on all areas of SU activity. During the congress the idea of a World Union of Ukrainian Women, which would unite all such women’s organizations under one superstructure, was discussed. Although set in motion later, in 1937, the proposition was not realized because of the disbanding of the SU by the Polish authorities and the outbreak of the Second World War. 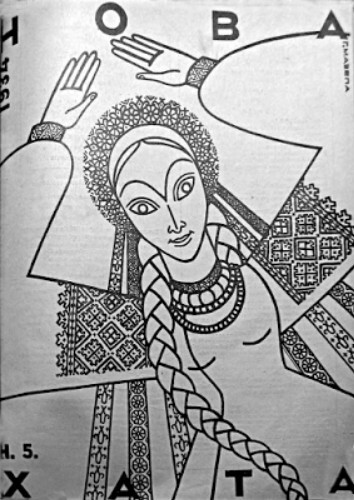 The SU published the biweekly Zhinka (edited by Milena Rudnytska from 1935) and the monthly Ukraïnka (1938–9, ed Mariia Strutynska), which was particularly popular among village women. SU members were also avid readers of other women’s periodicals, including the monthly Nova khata and the semimonthly Zhinocha dolia. Relations between the SU and other Ukrainian organizations were generally good through the 1920s, and the involvement of women in Ukrainian civic life was viewed as desirable. The union maintained a high degree of internal cohesion by concentrating on specific programs and immediate concrete issues and maintaining a moderate political stance, which effectively put theoretical questions of ideology in a secondary position. In the 1930s the situation changed dramatically. The Union of Ukrainian Working Women was formed in 1931 (initially as the Women’s Hromada) under the auspices of the Ukrainian Socialist Radical party as a breakaway group of political radicals from the SU. The Ukrainian Catholic church defended the traditional role of women and linked the sort of female consciousness demonstrated by the SU with socialism and atheism as well as with the destruction of the family and the moral fiber of society. In the 1930s an increasing number of Catholic lay bodies were formed, and competed for the loyalties of Ukrainian women. The Organization of Ukrainian Nationalists, also a proponent of a conservative role for women in society, likewise engaged large numbers of potential SU recruits (particularly among the young). Finally, in the mid-1930s a drive by the co-operative society Silskyi Hospodar to increase its female membership throughout the countryside was launched before discussions regarding SU co-operation had been completed. Relations between the two groups soured as a result. The SU executive maintained ties with international women’s organizations. In 1923 the SU became a member of the International Women’s Union and participated in its congresses in Rome (1923), Paris (1926), Berlin (1929), and Marseille (1933). The SU had a section in the International Women’s League of Peace and Freedom (WLPF) headed by B. Baran. 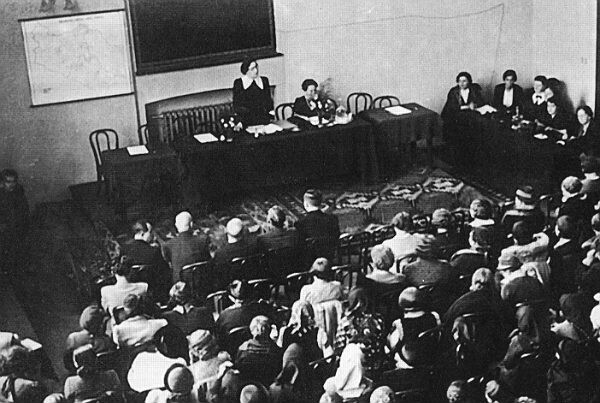 An official WLPF representative, M. Sheepshanks, attended the 1934 Stanyslaviv congress. The co-operative section of the SU was also a member of the Women’s Co-operative Guild and participated in its congresses in Vienna (1931), London (1933), and Paris (1937). In 1938 the Polish authorities disbanded the SU. The SU executive then founded Druzhyna Kniahyni Olhy to maintain some organizational continuity until it was possible to operate legally again. The new organization had a predominantly political profile and appealed mainly to the SU leadership and intelligentsia. Rank-and-file members usually joined local community associations (particularly the Silskyi Hospodar society and the Prosvita societies) until the SU was again allowed to function. The SU was disbanded following the Soviet occupation of Galicia in 1939. The presidents of the SU were Yevheniia Makarushka (1917–22), Katria Hrynevycheva (1923–4), Mariia Biletska (1924–5), Olena Fedak-Sheparovych (1925–6), M. Dontsova (1926–7), I. Vitkovytska (1927–8), and Milena Rudnytska (1928–39). Also prominent in the association were M. Biliak, Konstantyna Malytska, Ya. Ostrovska, Iryna Pavlykovska, M. Bilozor, O. Dzhydzhora-Dzoba, A. Horokhovych, Iryna Hurhula, and N. Selezinka. Among the notable branch heads were S. Olesnytska and A. Rubleva (Stanyslaviv), M. Vesolovska (Stryi), S. Chorpita (Kalush), M. Martynyk (Staryi Sambir), O. Malko (Velyki Mosty), S. Hryniv (Buchach), and M. Khoptiak (Rohatyn). The SU was revived on 21 February 1990 at a conference in Lviv. At the constituent congress held in Kyiv in December 1991, A. Pashko was elected president of the SU.